Lets Take a small break from the hyped 3G services by operators and look into news of other telecom operators. 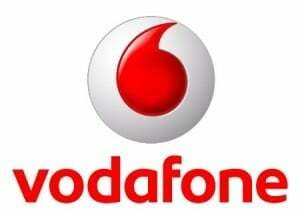 Vodafone is now making some news by launching a first of its kind Balance Transfer! Now you can send money ( aka Currency in your Mobile) to your friends in no time!! Thanks to USSD, Everything is Made too simple. All you need to Remember is a simple Format. Just Dial *131*Amount*FriendMobileNumber# to initiate a money transfer! And your existing balance will be instantly debited and sent to your friend! 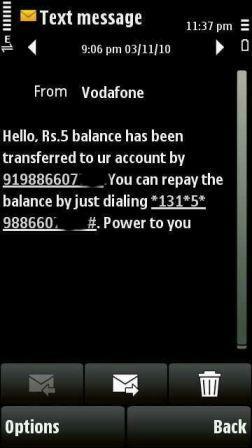 Suppose if you want to send 10 Rupees to your friend’s Number 9999999999 from your existing balance, all you need to do is dial *131*10*999999999# and wait for a confirmation pop up! Easy Isn’t it? Here is The Response Message your Friend gets when the Transfer is successful! You are allowed to transfer money to the same number only once in a day. The Above Service was tested in Karnataka Region. Let us know whether it is available in your region.